The cabaret duo that David Cameron tried to censor whips up a tasty cocktail of comedic song for their Crazy Coqs debut in BOUNDING AROUND. 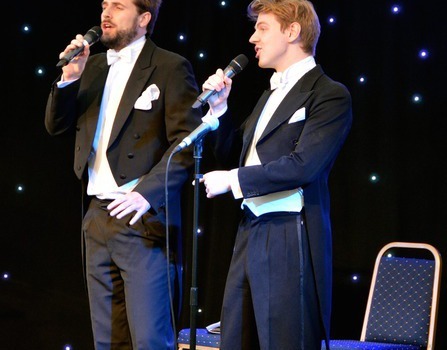 As lapsed Cambridge choral scholars, Bounder & Cad formed their unholy alliance to wing their way into University balls as a Rat Pack double-act. For no good reason, they wrote a Disney parody, The Prince Harry Song, which didn't go viral on YouTube- but led to an unexpected sequel which featured in international media. Ever since, the two have roved the land fearlessly, skewering English eccentricities with their rapier of satirical jazz. Their Cameron/Clegg-themed rewrite of Me And My Shadow for the Downing Street Christmas party was vetoed by the PM's aides, but performed nonetheless after a rallying call from the crowd. Join them for a spritz of song from their story so far, stirred with Porter, Coward and Legrand - and garnished with some minty-fresh numbers written specially for this show. Delicious. Bounder & Cad are Adam Drew and Guy Hayward, accompanied by pianist Chris McMurran.